A major element of fun in games, said Goffman (in the essay of that name) is that “the outcome or pay-off has a good chance of remaining unsettled until the end of play.” But what happens if in fact contenders are in fact equally matched in strategic ability and stamina? In the 2018 World Chess Championships between defender Magnus Carlsen and challenger Fabiano Caruana there were twelve draws. I started paying attention around number five, about the same time as the Guardian began digging in and following every liveblog with a summary story and color pieces. Each draw was different and was framed differently in reports and commentary. Next came an endurance test (Game #6) of six and a half hours (though actually shorter than the first game which ran seven hours). Game #9 broke the previous record of eight consecutive draws in a World Championship final (between Kasparov and Anand in 1995). Game #11 was nearly won by Caruana. 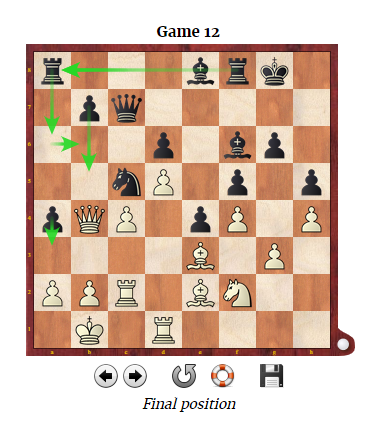 In game #12, the last game, commentators were nattering blithely away around move 31. No game so far had ended before move 34. They were stunned when they realized Carlsen had extended his hand and Caruana shook it, ending the game. Carlsen still had a lot of time on the clock and a position that corralled key White pieces behind strong bishop diagonals (diagram from chessbase.com). The chess world was not happy with this quick result in a game was not yet obviously deadlocked. It was “disappointed,” to use the most salient word. Strings of draws are common in top chess. The 1972 Fischer-Spassky championship had 11 draws out of the 21 games, including a seven-game draw streak. Kasparov and Anand in 1995 drew 13 games out of 18, including the eight-game streak referenced above. In the previous World Championship between Carlsen and Karjakin in 2016, there were 10 draws in the 12 classical games, ending one-all, and two draws in the four speed games (Carlsen won the last two). This was such an even result, for so long, that one could question the drive to crown a single winner. Nobody did, though, in part because Karjakin was thought to be playing above his usual level; he was ranked lower than Caruana when he won the Challengers’ Tournament and the right to face Carlsen. Tie-breaking rapid games were introduced for the first time in 1998. Before that, championships were just longer runs of classical games. The current rules provide, in the ultimate case, for 12 classical games, four rapid games, five pairs of blitz games, and, if all else fails a “sudden-death” (the official FIDE term) or “Armageddon” game. In Armageddon, things are radically unbalanced: White gets five minutes on the clock and black gets four, but if there is a draw, Black wins. Thus there cannot be a draw in the final game. The message is: Chess is set up for exciting play through balance, but in the end we require a winner and a loser. That is the purpose of the championship. We cannot provide for anything else. This entry was posted on 28 November 2018 at 11:16 pm and is filed under Uncategorized. You can follow any responses to this entry through the RSS 2.0 feed. Both comments and pings are currently closed.